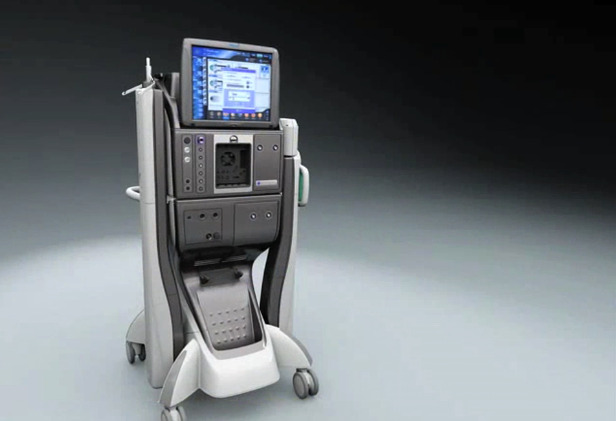 The Alcon CONSTELLATION® Vision System establishes the standard of surgical control. Combining ULTRAVIT® High Speed Vitrectomy Probes with Duty Cycle Control, Integrated Pressurized Infusion & IOP Compensation, Advanced Xenon Illumination, and V-LOCITY® Efficiency Components to deliver an exceptional level of performance. 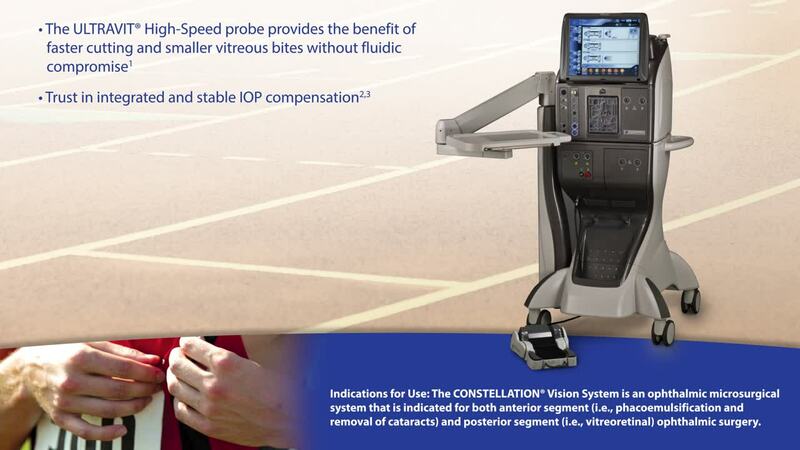 Use the links below to navigate and discover the Constellation® Vision System. INDICATION: The NGENUITY® 3D Visualization System consists of a 3D stereoscopic, high-definition digital video camera and workstation to provide magnified stereoscopic images of objects during micro-surgery. It acts as an adjunct to the surgical microscope during surgery displaying real-time images or images from recordings. WARNINGS: The system is not suitable for use in the presence of flammable anesthetics mixture with air or oxygen. There are no known contraindications for use of this device. PRECAUTIONS: Do not touch any system component and the patient at the same time during a procedure to prevent electric shock. When operating in 3D, to ensure optimal image quality, use only approved passive-polarized glasses. Use of polarized prescription glasses will cause the 3D effect to be distorted. In case of emergency, keep the microscope oculars and mounting accessories in the cart top drawer. If there are any concerns regarding the continued safe use of the NGENUITY® 3D Visualization System, consider returning to using the microscope oculars. ATTENTION: Refer to the User Manual for a complete list of appropriate uses, warnings and precautions. CAUTION: Federal law restricts this device to sale by, or on the order of, a physician. As part of a properly maintained surgical environment, it is recommended that a backup IOL Injector be made available in the event the AutoSert® IOL Injector Handpiece does not perform as expected. INDICATIONS FOR USE: The CONSTELLATION® Vision System is an ophthalmic microsurgical system that is indicated for both anterior segment (i.e., phacoemulsification and removal of cataracts) and posterior segment (i.e., vitreoretinal) ophthalmic surgery. The ULTRAVIT® Vitrectomy Probe is indicated for vitreous cutting and aspiration, membrane cutting and aspiration, dissection of tissue and lens removal. The valved entry system is indicated for scleral incision, canulae for posterior instrument access and venting of valved cannulae. The infusion cannula is indicated for posterior segment infusion of liquid or gas. Retinal photocoagulation, panretinal photocoagulation and intravitreal endophotocoagulation of vascular and structural abnormalities of the retina and choroid including: Proliferative and nonproliferative retinopathy (including diabetic); choroidal neovascularization secondary to age-related macular degeneration; retinal tears and detachments; macular edema, retinopathy of prematurity; choroidal neovascularization; leaking microaneurysms. Iridotomy/Iridectomy for treatment of chronic/primary open angle glaucoma, acute angle closure glaucoma and refractory glaucoma. 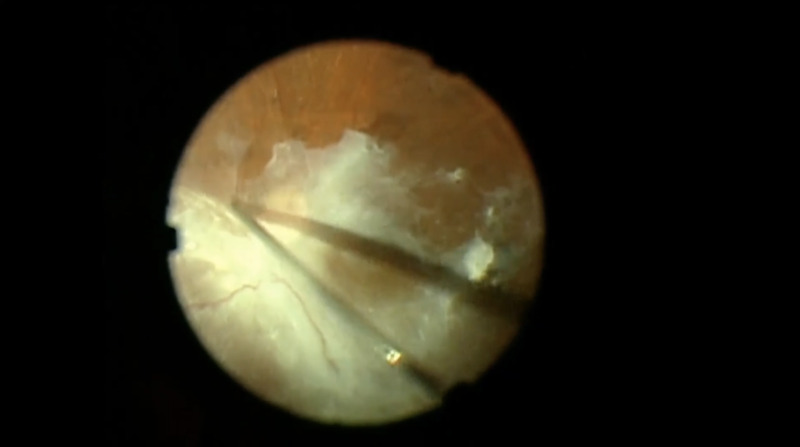 Trabeculoplasty for treatment of chronic/primary open angle glaucoma and refractory glaucoma. And other laser treatments including: internal sclerostomy; lattice degeneration; central and branch retinal vein occlusion; suturelysis; vascular and pigment skin lesions. The FlexTip* laser probe is intended to be used with ALCON® 532nm laser systems. Ultrasound with UltraChopper® Tip achieves the functionality of cataract separation. The INTREPID® AutoSert® IOL Injector Handpiece achieves the functionality of injection of intraocular lenses. The INTREPID® AutoSert® IOL Injector Handpiece is indicated for use with AcrySof® lenses SN60WF, SN6AD1, SN6AT3 through SN6AT9, as well as approved AcrySof® lenses that are specifically indicated for use with this inserter, as indicated in the approved labeling of those lenses. 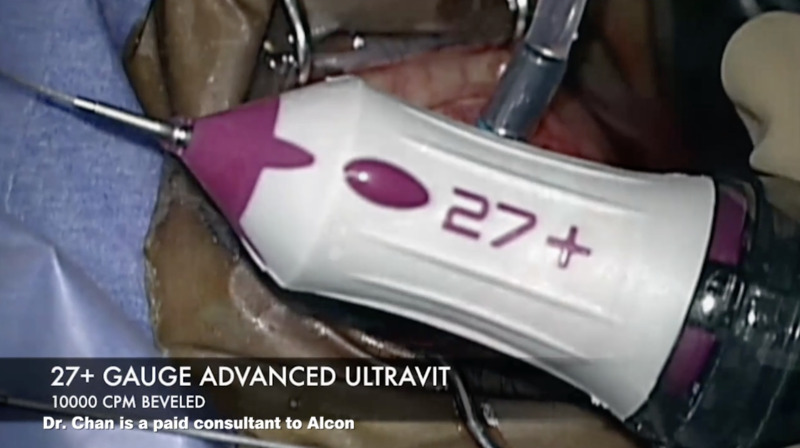 The disposables used in conjunction with ALCON® instrument products constitute a complete surgical system. Use of disposables and handpieces other than those manufactured by Alcon may affect system performance and create potential hazards. Attach only Alcon supplied consumables to console and cassette luer fittings. Do not connect consumables to the patient’s intravenous connections. Mismatch of consumable components and use of settings not specifically adjusted for a particular combination of consumable components may create a patient hazard. Vitreous traction has been known to create retinal tears and retinal detachments. The closed loop system of the CONSTELLATION® Vision System that adjusts IOP cannot replace the standard of care in judging IOP intraoperatively. If the surgeon believes that the IOP is not responding to the system settings and is dangerously high or low, this may represent a system failure. Note: To ensure proper IOP Compensation calibration, place infusion tubing and infusion cannula on a sterile draped tray at mid-cassette level during the priming cycle. Leaking sclerotomy may lead to post operative hypotony. Back scattered radiation is of low intensity and is not harmful when viewed through a protective filter. All personnel in the treatment room must wear protective eyewear, OD4 or above at 532nm, when the system is in Standby/Ready mode as well as during treatment. The doctor protection filter is an OD greater than 4 at 532nm. The infusion cannula is contraindicated for use of oil infusion. Attach only Alcon supplied products to console and cassette luer fittings. Improper usage or assembly could result in a potentially hazardous condition for the patient. Mismatch of surgical components and use of settings not specifically adjusted for a particular combination of surgical components may affect system performance and create a patient hazard. Do not connect surgical components to the patient’s intravenous connections. Each surgical equipment/component combination may require specific surgical setting adjustments. Ensure that appropriate system settings are used with each product combination. Prior to initial use, contact your Alcon sales representative for in-service information. Care should be taken when inserting sharp instruments through the valve of the Valved Trocar Cannula. Cutting instrument such as vitreous cutters should not be actuated during insertion or removal to avoid cutting the valve membrane. Use the Valved Cannula Vent to vent fluids or gases as needed during injection of viscous oils or heavy liquids. Visually confirm that adequate air and liquid infusion flow occurs prior to attachment of infusion cannula to the eye. 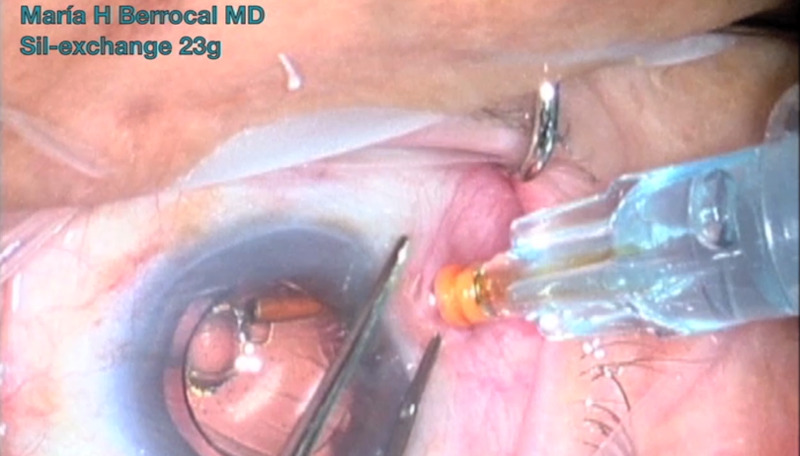 Ensure proper placement of trocar cannulas to prevent sub-retinal infusion. Minimize light intensity and duration of exposure to the retina to reduce the risk of retinal photic injury. Use of low vacuum limits, low flow rates, low bottle heights, high power settings, extended power usage, power usage during occlusion conditions (beeping tones), failure to sufficiently aspirate viscoelastic prior to using power, excessively tight incisions, and combinations of the above actions may result in significant temperature increases at incision site and inside the eye, and lead to severe thermal eye tissue damage. Adjusting aspiration rates or vacuum limits above the preset values, or lowering the IV pole below the preset values, may cause chamber shallowing or collapse which may result in patient injury. When filling handpiece test chamber, if stream of fluid is weak or absent, good fluidics response will be jeopardized. Good clinical practice dictates the testing for adequate irrigation and aspiration flow prior to entering the eye. Ensure that tubings are not occluded or pinched during any phase of operation. 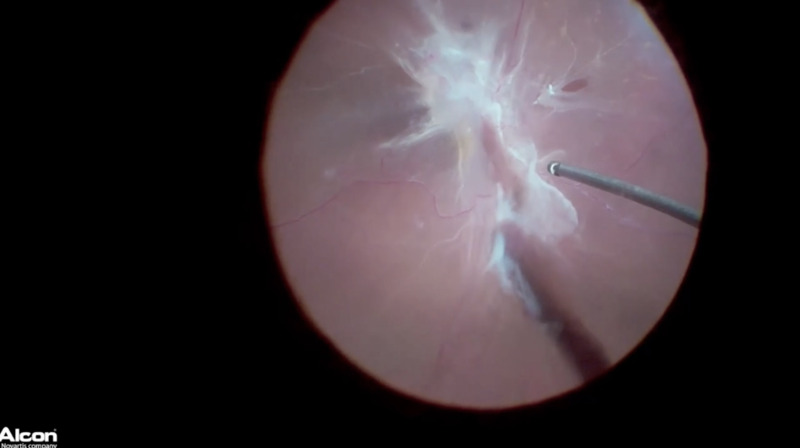 ADVERSE EVENTS/COMPLICATIONS: Use of handpieces during intraocular procedures in the absence of irrigation flow and/or in the presence of reduced or lost aspiration flow can cause excessive heating and potential thermal injury to adjacent eye tissues. ATTENTION: Please refer to the CONSTELLATION® Vision System Operators Manual for a complete listing of indications, warnings, and precautions. *Trademarks are property of their respective owners. INDICATIONS FOR USE: The CONSTELLATION® Vision System is an ophthalmic microsurgical system that is indicated for both anterior segment (i.e., phacoemulsification and removal of cataracts) and posterior segment (i.e., vitreoretinal) ophthalmic surgery. The ULTRAVIT® Vitrectomy Probe is indicated for vitreous cutting and aspiration, membrane cutting and aspiration, dissection of tissue and lens removal. The valved entry system is indicated for scleral incision, canulae for posterior instrument access and venting of valved cannulae. The infusion cannula is indicated for posterior segment infusion of liquid or gas. Leaking sclerotomies may lead to post operative hypotony. ATTENTION: Please refer to the CONSTELLATION® Vision System Operators Manual for a complete listing of indications, warnings and precautions. INDICATIONS FOR USE: The Finesse™ Flex Loop is a manual ophthalmic surgical instrument intended to aid in ophthalmic surgical procedures. The device may be used in posterior segment surgery to create an edge on a membrane to begin peeling with forceps. The device is provided sterile and is intended for single use. It is not recommended to remove the ILM (internal limiting membrane) with the device. Scraping the retina can cause irreversible damage to the nerve fibers. Inspect tip for damage (e.g. burrs, bending or loosening), check loop functionality (extendability), and ensure the loop is fully retracted before inserting instrument into the eye. ATTENTION: Reference the Directions for Use for a complete listing of indications, warnings, and precautions. INDICATIONS FOR USE: The GRIESHABER® DSP Aspheric Macular Lens is used to visualize the fundus and retinal structures during vitreoretinal surgery. It is designed as a self-retaining contact lens to allow hands-free operation. WARNINGS AND PRECAUTIONS: The device may be used only by well trained physicians and personnel. Potential risk from reuse or reprocessing include: reduced optical quality, surface damage on the optics, and foreign particle introduction to the eye. 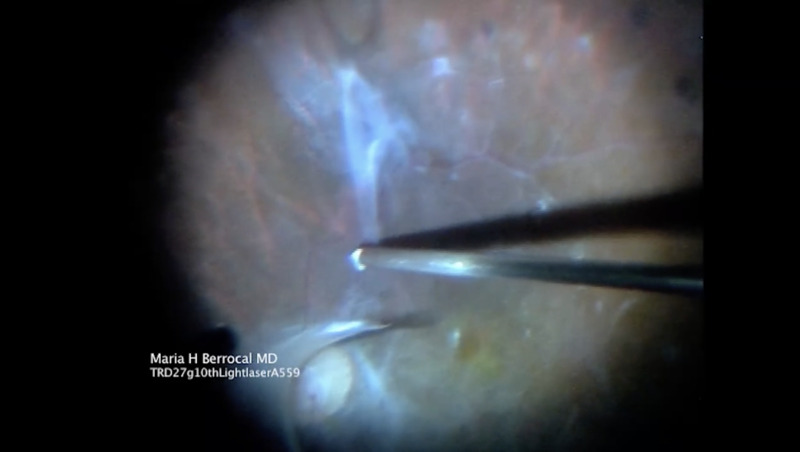 The surgeon’s team has to ensure that sufficient viscous fluid is available throughout usage of the lens for continuous humidification of the cornea. Attention: Reference the Directions for Use for a complete listing of indications, warnings, and precautions. INDICATIONS FOR USE: GRIESHABER® DSP instruments are a line of single-use vitreoretinal micro-instruments which are used in ophthalmic surgery, for cases either in the anterior or the posterior segment. The GRIESHABER® Advanced Backflush Handles DSP are a family of instruments for fluid and gas handling in vitreoretinal surgery. WARNINGS AND PRECAUTIONS: Potential risk from reuse or reprocessing GRIESHABER® DSP instruments include: foreign particle introduction to the eye; reduced cutting or grasping performance; path leaks or obstruction resulting in reduced fluidics performance. Verify correct tip attachment, function and tip actuation before placing it into the eye for surgery. For light fiber instruments: Minimize light intensity and duration of exposure to the retina to reduce risk of retinal photic injury. The light fiber instruments are designed for use with an ALCON® illumination source. 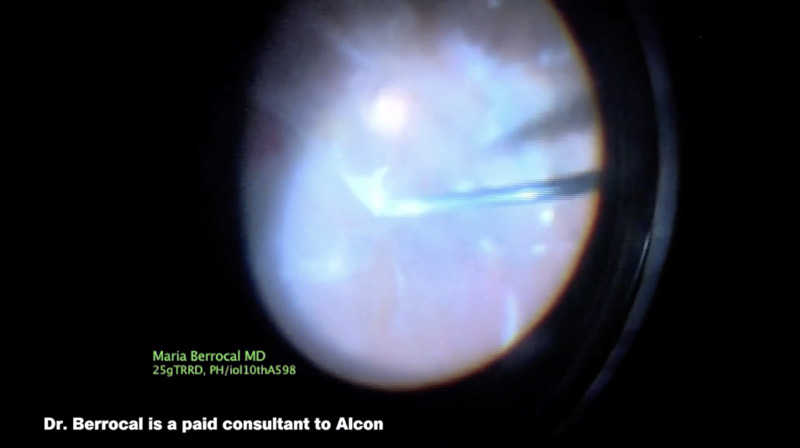 Good clinical practice dictates the testing for adequate irrigation and aspiration flow prior to entering the eye. If stream of fluid is weak or absent, good fluidics response will be jeopardized. Use appropriate pressure supply to ensure a stable IOP. If unwanted tissue gets engaged to the aspiration port, it should be released by interrupting aspiration before moving the instrument. ATTENTION: Please refer to the product labeling for a complete listing of indications, warnings, and precautions. CONTRAINDICATIONS: Patients with a condition that prevents visualization of target tissue (cloudy cornea, or extreme haze of the aqueous humor of the anterior chamber of vitreous humor) are poor candidates for LIO delivered laser treatments. COMPLICATIONS: Corneal burns, inflammation, loss of best-corrected visual acuity, loss of visual field and transient elevations in intraocular pressure can occur as a result of ophthalmic laser treatment. Unintentional retinal burns can occur if excessive treatment beam power or duration is used.Attention: Reference the Directions for Use for a complete listing of indications, warnings, and precautions.